Roles are predefined sets of permissions. After users are assigned a specific role that is typically based on job functions, they can manage information relevant to their job role. One user can even have several roles to cover for a flexible set of functions. You can create as many roles as required and configure permissions for them according to the needs of your company. For system capabilities, you enable or disable the options you need. The set of available access levels depends on the entity’s ownership type which limits the range of access levels you can set for actions on this entity. The following section explains what permissions you can apply to roles, what access levels can be set to permissions, and how access levels depend on the owner of the selected entity. View A user can view the entity record details. Create A user can create a new entity record. Edit A user can edit entity records. Delete A user can delete an entity record. 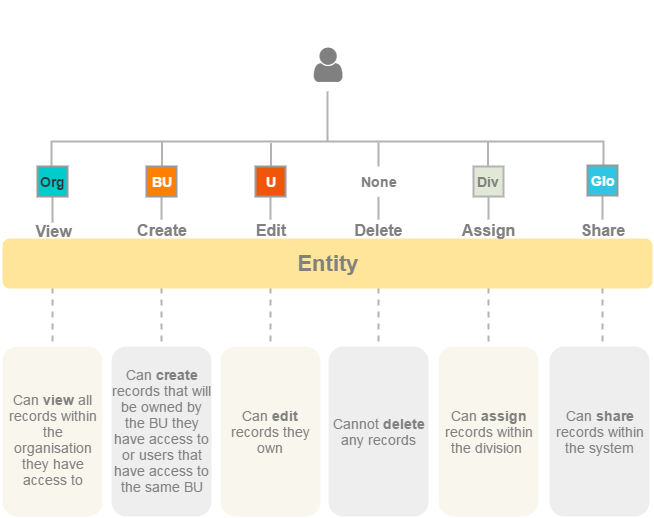 Assign A user can change the owner of an entity record. Share A user can share an entity record with other users. Configure A user can set up the system configuration for themselves and other users. User Entity records owned by the user (providing the user has access to the organization(s) for which these records were created). Business Unit Entity records owned by the business unit(s) the user has access to or by any user that has access to the same business unit. Organization All entity records within the organization the user has access to. This access level is hidden if there is only one organization. Only two access levels are always available: None (access is denied) and Global (access to all entity records) within the system. The set of available access levels depends on the entity’s ownership type. The ownership type limits the range of access levels you can set for actions on this entity. For example, you cannot set the User access level if the entity ownership type is Organization. The None access level completely restricts access to entity records. It says ‘No one can perform this action on the entity’. Keep in mind that as soon as the entity is created, its ownership type cannot be changed. Consequently, you cannot change the predefined ownership types of system entities (such as an account or a business unit).